Textile manufacturing and finishing company offering precision coating and converting of high-performance, technical textiles for industrial and consumer applications. Includes company profile, sales, and contact information. Manufacture rubber sheets and insertion, skirt boards, industrial rubber hoses, rubber mats, floor coverings, and rubber molded products. Manufacturers a range of rubber molded components including: gaskets, rubber mountings, rubber bushing, and suspension parts. Fabricators of sponge rubber, garage exhaust hose, floor mats and matting, flexible hose and ducting, sheet rubber, and specialty rubber products. Molded rubber products. Molded rubber to metal components. Injection, transfer, and compression molding of all rubber elastomers. Designs, develops and fabricates rubber products for industry. Products include belts, rolls and rollers, rubber and rubber cover products. Based in Spain. USA. Suppliers of a wide range of rubber and rubber backed mats and mattings for commercial, residential and institutional applications. Also, custom logo mats. Technical information. India. Broadloom woven carpets, and rubber backed rugs and mattings, from coir, jute, sisal and seagrass. Also, rubber mats for industrial and commercial uses. Section on the physical and chemical properties of coir. Manufacturer and exporter in Hong Kong. Product range includes rubber washers, O-rings, gaskets, rubber feet, rubber pads, silicone rubber parts, soft PVC products, EVA products, sponge and foam products. Manufacturer of rubber keypads, membrane switches, keypad sets, and rubber accessories. Rubber manufacture of extruded, molded fabricated and die-cast rubber. Canada. Manufacturer of rubber and ebonite roller and moulded rubber parts. Manufacturer of rubber and ebonite rollers and molded rubber parts. Manufactures engineered molded rubber products and rubber bonded-to-metal assemblies for dynamic and static applications. Molds custom rubber and rubber-to-metal components for a variety of industries. Manufacturer of standard and custom molded, extruded and fabricated rubber parts and rubber bands. Company is ISO 9001:2000 registered. Distributor of industrial rubber products including conveyor-fabricated belt, hose and assemblies, gaskets, sheet rubber, and o-rings. Natural rubber producer and exporter of both raw materials for industrial use and finished products including tires and rubber gloves. Manufactures rubber and latex products including bladders, hot water bottles, footwear soles and rubber mats. Manufacturing precision rubber rollers for printing, mechanical, pinch, offset, idler and hot stamping. Includes a rubber property comparison chart. Specialist offering moulding and bonding of rubber, rubber to metal bondings and supply of complementary items in cork, felt leather and plastics. Custom manufactures rubber products for industry. Recoats rubber rollers, does rubber-to-metal bonding plus builds hard-to-find replacement parts. Manufactures custom rubber products for industries. Capabilities include rubber to metal bonded parts and other substrates such as plastic, nylon and fabric reinforcements. Manufacturer and exporter of silicone rubber parts including rubber keypad, rubber keycap, phosphorescent keypad, and laser etching keypad. Taiwan. Manufacturers of square shaped rubber threads for applications in apparel and clothing accessories. Also, rubber tapes and sheets. Custom manufacturing services. English and Chinese. Manufacturer of 'O' rings, seals, custom molded rubber components, and rubber-to-metal bonded systems. Serving automotive and general industrial original equipment manufactures. Manufactures molded rubber products, specializing in non-conductive parts. Offers injection, compression and transfer rubber molding. Lists part samples and common elastomers used. Manufacturer of a wide range molded rubber products with rubber tile, stair tread and anti-fatigue mats applicable to automotive and or transportation industry shop and facility use. Manufacturers of industrial rubber products including hose pipes, rubber sheets, and molded and extruded items. India. Manufacturer with ISO-9002 quality certification. Products include rubber gaskets, o-rings, die cutting, rubber extrusions and molded rubber products. If the business hours of Reeves Brothers, Inc in may vary on holidays like Valentine’s Day, Washington’s Birthday, St. Patrick’s Day, Easter, Easter eve and Mother’s day. We display standard opening hours and price ranges in our profile site. We recommend to check out reevesbrothers.com/ for further information. 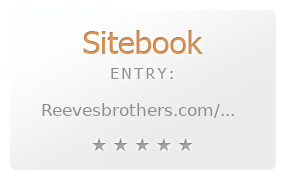 You can also search for Alternatives for reevesbrothers.com/ on our Review Site Sitebook.org All trademarks are the property of their respective owners. If we should delete this entry, please send us a short E-Mail.